There’s really not a whole lot to recap, so this will be more of a preview for this Saturday. 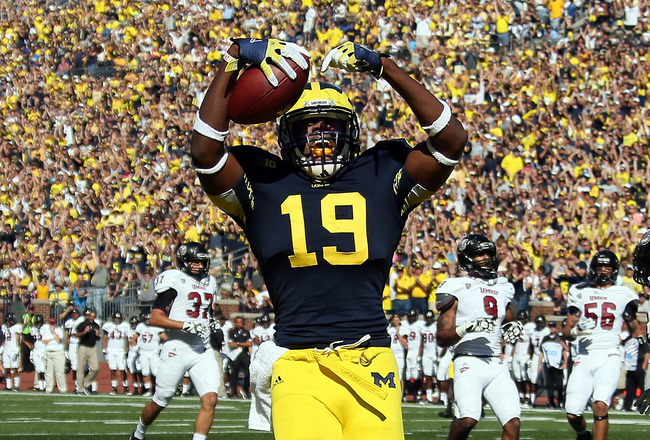 It was basically what you expected when Michigan plays the UMass Minutemen. The offensive line got a better push against an inferior defensive line and opened up the run, and the defense looked fairly solid. Denard only had one really awful throw, which was obviously when he threw the ball about 5 minutes too late to Jeremy Jackson and they picked it off and housed it. All things considered, I was pretty content with what I saw, particularly from the freshmen. The only thing I don’t understand is how or why people want Russell Bellomy to be the starting quarterback next year, and leave Devin Gardner at wide receiver. Sure Gardner is arguably the team’s best receiver, but Bellomy is pathetic. Yeah he had basically all walk-on offensive linemen to avoid burning redshirts in a blowout, but still. He has yet to complete a pass in his career, and rushed for 8 yards on 5 attempts. I don’t see how this team can do anything but play Gardner or start Shane Morris. At least on the plus-side, Justice Hayes looked great in garbage time, with 3 rushes for 19 yards and a TD. I will say that if Michigan plays that way against Notre Dame, they’re going to get mauled. Notre Dame exposed Michigan State as a one-dimensional team (which is what I’ve been saying they were for months, but whatever). Andrew Maxwell is a worse passer than Denard, and with an extremely stout front seven, Notre Dame had literally no problem. Manti Te’o is an absolute stud, and it is going to be imperative that the offensive line keep him out of the backfield and away from Denard. Notre Dame’s secondary has had some injuries, with two starters already knocked out for the year, but with their pass rush, I’m not sure Denard will have enough time to take advantage of that weakness. This is a perfect game for Devin Funchess and Roy Roundtree to go off. Michigan’s defensive line is still a huge concern. Will Campbell has proven to be a bona fide bust at this point, and I think we can attribute that to having some bad habits coming into school, and Rich Rodriguez trying to convert him to offensive guard. I did like the new overloaded 3-3-5 nickel defense that Greg Mattison installed for this past week. Putting Frank Clark and Jake Ryan on the end of the line with Craig Roh and Jibreel Black inside was a nice mix up look. It’s also become incredibly clear that the young Michigan freshmen linebackers are going to be studs. James Ross and Joe Bolden have been awesome, and at least this gives Mattison something to work with in the future. The bad news for Michigan continues going into this game, because it looks like Notre Dame finally found a quarterback. And while they don’t have a great running back and no Michael Floyd, having the best tight end in the country (Tyler Eifert) is certainly going to ease that pain. He was targeted 9 times out of 32 pass attempts last week, and is clearly a favorite of quarterback Everett Golson’s. His height is going to provide a serious advantage for them against the Michigan safeties. The good news coming into this game though is the fact that Notre Dame still runs a spread offense. Michigan doesn’t have to worry about getting overpowered like they did against Alabama, and the defense can try to use its speed, to make the necessary plays. The defense does need to start producing turnovers though, because they haven’t done hardly anything in that department all year. If the Michigan defense can get a few turnovers and Denard doesn’t throw any horrible picks, Michigan should be able to control the game and get the win. Notre Dame won’t want to lose four straight to Michigan, so they’re going to come out hard right out of the gate. I mean seriously, three straight wins all within the last-minute, Notre Dame has to be losing their minds. The only plan should be to weather the storm early and then go to work on them later. 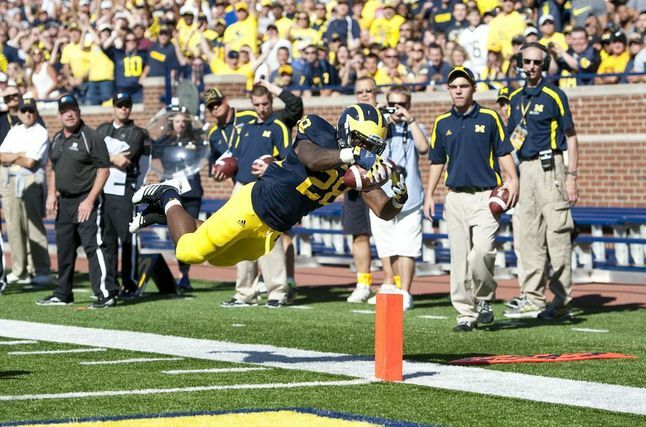 Give the ball to Denard, let him make plays, and have our defense not break down. It’s quite simple and effective, unless of course you’re playing Alabama, but it is exactly what Michigan needs to do to get their fourth straight win. I think Michigan will end up winning this game in a squeaker (as usual), and it will bring Notre Dame back down to earth, and get the media to realize they aren’t “back” yet. This entry was posted in College Football and tagged Alabama Crimson Tide, Andrew Maxwell, Craig Roh, Denard Robinson, Devin Funchess, Devin Gardner, Everett Golson, Frank Clark, Greg Mattison, Jake Ryan, James Ross, Jeremy Jackson, Jibreel Black, Joe Bolden, Justice Hayes, Manti Te'o, Michael Floyd, Michigan State, Michigan vs. Notre Dame 2009, Michigan vs. Notre Dame 2010, Michigan vs. Notre Dame Under The Lights, Michigan Wolverines Football, Notre Dame, Rich Rodriguez, Roy Roundtree, Russell Bellomy, Shane Morris, Tyler Eifert, UMass Minutemen, Will Campbell. Bookmark the permalink.